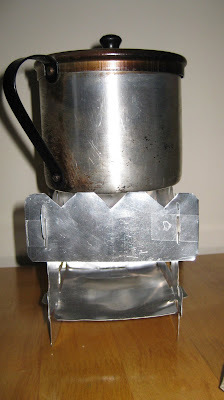 I have started to get into backpacking/emergency stoves. I spend way to much time looking and thinking about these stoves. So far I have five stoves ranging from canister stoves, alcohol, and wood. What I really dislike about the canister stoves is I can never tell when I am going to run out of fuel. So I end up carrying an extra canister which goes against the ultra-light backpacking principles. 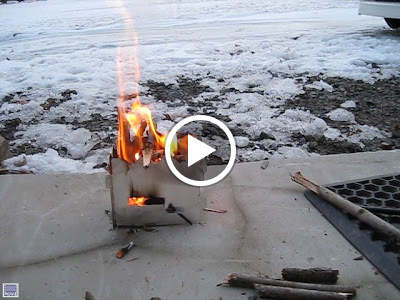 Alcohol stoves are great and super cheap to build and use. However, they take a lot longer to boil water than the canister stoves and I hate packing alcohol. My perfect stove would be super light and have an unlimited fuel source, and it would be efficient. In addition I want it to take up the smallest volume of my pack possible. 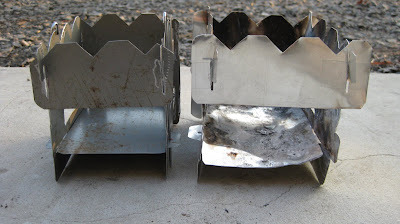 With those desires I used the 'Google' and found Nimblewill Nomad's Little Dandy Stove. 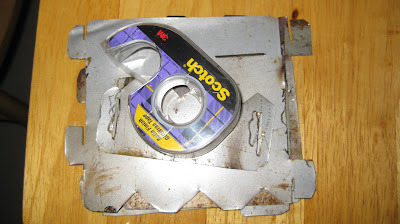 It collapses down to about the size of a CD case and can be used for wood and alcohol. 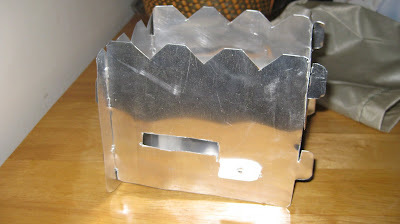 My first prototype used light weight aluminum flashing and was built exactly to the specs on Nomad's directions. It was super light, but in hindsight a little too light. 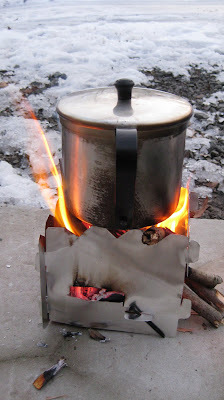 The fire in it got so hot that the weight of the pot with water in it folded the aluminum. 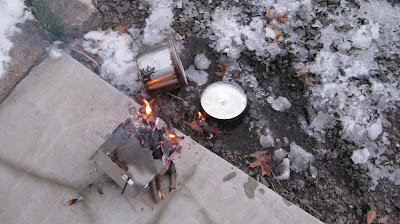 About 10 minutes into the first burn the aluminum buckled and dumped the boiling water. After seeing how the aluminum flashing was not going to handle the heat and weight of the pot, I decided to use some light steel for prototype 2. In addition I also decided to adjust the size of the stove so that it better fit my pots. I shortened the width by about a half inch and the length by an inch. 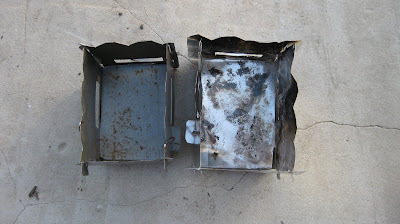 This picture shows the comparison between the new stove and the old one. 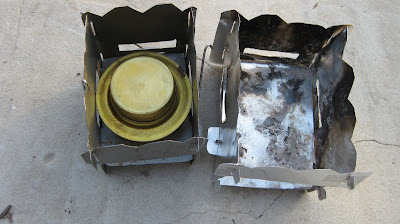 Stove is the correct size to be used as a pot stand/windscreen for the brass Trianga alcohol stove. 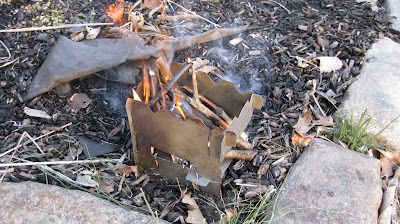 First burn with the steel prototype. 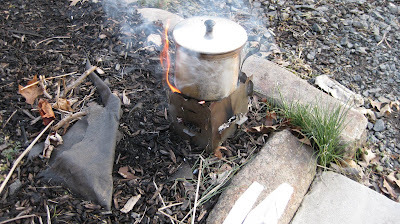 I was able to get three cups of water to boil in around twelve minutes during a fairly windy day using only a handful of twigs. I am happy with the end result and how well it works. It is heavier than I wanted, I believe it is around seven ounces. 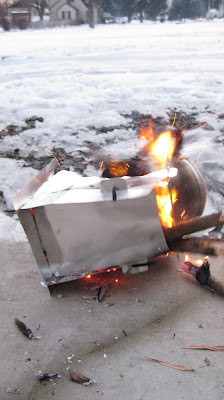 If I decide to use this as my main stove I am going to build it with titanium and it should reduce the weight by half. 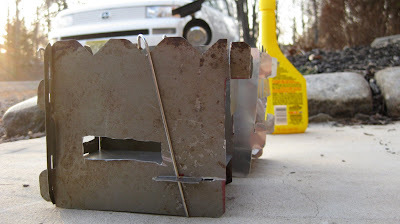 I am going to build another prototype of this stove and get rid of the holes in the side plates and trade the base plate with a steel grate. It should help with the efficiency of the stove and help it block the wind better. I have always been an admirer of the Nomads' design. 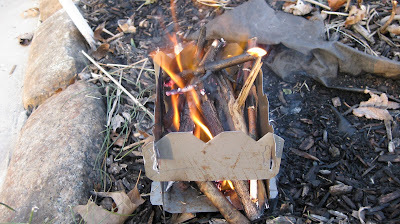 I usually carry a small amount of alcohol and a soda can stove, but only use it as a backup. 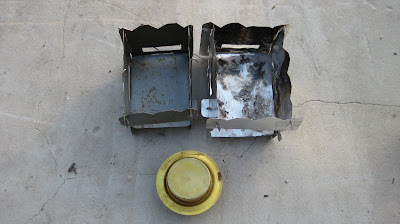 I almost always burn found fuels in a little folding stove I built for cooking. I just don't understand the logic of cooking on fuel cannisters when there is fuel at your feet. The big advantage with the Nomad's design is that it folds flat, is durable and is relatively light weight. Especially considering you don't have to carry fuel. I hope you post a follow-up after your knew design mods.